Advanced Retail Metrics on the Home Dashboard – How can we help? If you are currently on a Vend store plan that has access to the Home Dashboard, you will be able to take full advantage of a range of Advanced Retail Metrics. In addition to the Sales Performance section, you will have a choice of 9 different Advanced Retail Metrics that will appear under the Things to Know section. All upcoming or outstanding stock orders and inventory counts will also appear on the home dashboard, under the Things to Do section. 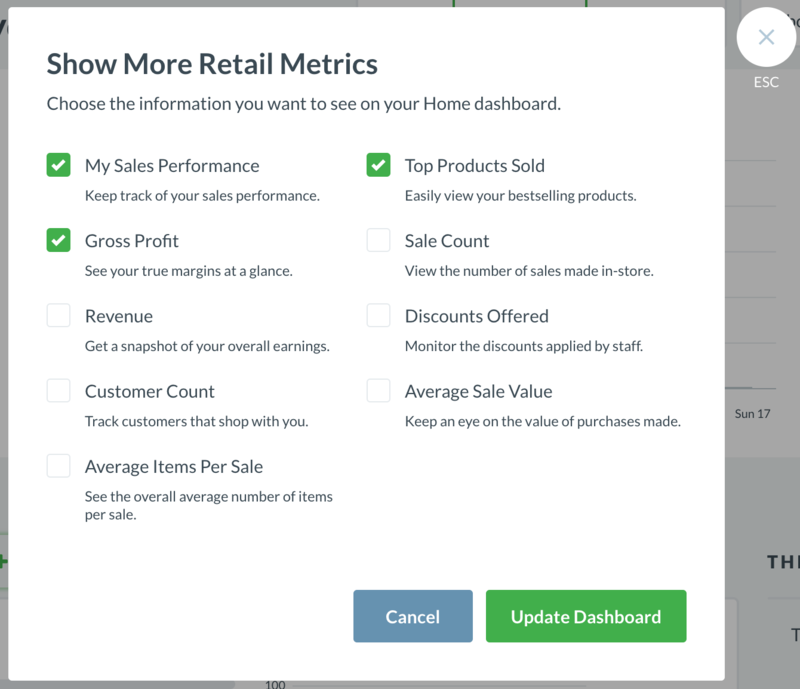 To add or remove Advanced Retail Metrics to your home dashboard, click the Show More Retail Metrics button next to Things to Know. A window will appear where you may choose which information to show or hide on your home dashboard. To do this, tick or untick your chosen metrics and click Update Dashboard. My Sales Performance: This metric will let you see your personal sales performance. This can be useful if you want your cashiers and managers to track their sales on a daily, weekly or monthly basis. Gross Profit: This metric will let you see your profit margins. This is calculated by taking your total revenue in a specified period and reducing it by the total cost of products sold for that same period. Revenue: The Revenue metric will give you a daily, weekly or monthly snapshot of your overall earnings. If you have revenue targets, this can be a convenient way of quickly checking on your progress without having to delve too deep into further reports. Customer Count: Enabling the Customer Count metric will allow you to track the number of customers that shop with you on a daily, weekly or monthly basis. When combined with sales data from the same period, This metric can become very useful when analysing your customer's shopping trends. Top Products Sold: This metric will give you a quick snapshot of the products in your store that have sold the most over a daily, weekly or monthly period. Sale Count: The Sale Count metric lets you view the total number of sales made in-store; daily, weekly or monthly. Discounts Offered: Enabling the Discounts Offered metric allows you to monitor the store discounts that are being applied by you and your staff. Average Sale Value: Keep an eye on the value of purchases made.